It was the start of a school year and another study session, at the University of Guelph, when Theoren and I had first exchanged (prolonged) glances with each other. Later that day I returned to the library, following the homecoming game, and our first exchange of words occurred when Theoren asked me what the score of the game was. A few weeks later, our next interaction occurred in the same library. While I had left my cubicle for a study break, Theoren had arrived at the library annoyed to find that someone had stolen his regular cubicle. According to library regulars, it was a well-known rule to leave an empty cubicle in between two occupied cubicles. So, out of spite, Theoren decided to set up camp at the cubicle that was right beside mine. Upon returning from my break, I was pleasantly surprised to see Theoren unloading his books at the desk beside mine - and Theoren was pleased to find out that I was the one who had stolen his spot. We chatted for a bit about how we were overwhelmed with our workloads, and then we both returned to our books. A little while later, out of the corner of my eye, I saw sour key candies - labeled ‘Baby Soothers’ - carefully being levered over the side of my cubicle with a sticky note attached stating, "hope these soothe your stress". He had quickly figured out the way to my heart. Three years later, while driving from London to a resort on Lake Simcoe, Theoren insisted that we stop in Guelph. I kept asking him why he thought it would be a good idea, because it was totally out of the way and I was so excited to get to our mini-vacation! We ended up at the restaurant where we had our first date, and then we drove around Guelph to different places where we had shared fond memories together. The last stop was the library where we had first met at U of G. In front of the ascending steps to the famous Ontario Veterinary College, Theoren got down on one knee and proposed – all the while some of our best friends were hiding in a van in the parking lot taking photos of us! Inevitably, my answer to his big question was, ‘Yes’! Being that we met and got engaged in the fall, the month of September seemed to be an obvious choice to have our wedding. We had looked around for the perfect venue for quite some time, and were losing faith in ever feeling that ‘a-ha’ moment for where our wedding would take place. Then we visited the St. Marys Golf & Country Club, met Ashton (Director of Special Events), and we were confidently SOLD! Ashton had the most infectious smile, positive attitude and sense of humour. Being the bride, I knew ahead of time that I would personally be doing most of the wedding planning, yet I had no prior experience. At first, wedding planning seemed daunting, but I had a strong suspicion that Ashton would walk me through every detail. And that she did. The whole planning experience with SMGCC was so enjoyable, and so organized! As well, from our first visit to St. Marys Golf & Country Club right through our wedding day, Theoren and I felt that SMGCC had a warm, relaxed, yet classy and sophisticated ambiance. We knew it would be the perfect place for our wedding, because we felt at home there and it suited our personalities so well. Theoren and I were also SO impressed with the final design of the Hideaway space, which we had booked for our reception before the construction and renovations had even begun. When it came time to view the Hideaway, during the SMGCC Bridal Open House, Theoren had to pick my jaw up off of the floor – I was BLOWN AWAY! I honestly couldn’t believe that this was the place where we would be lucky enough to have our wedding. A few short months after the Open House, our wedding was finally here – September 23rd, 2017. At our first look, I was shaking with so much excitement as I approached my husband-to-be! He looked so handsome in his custom suit, which was tailored by David E. White in London, Ontario. The suit even had our wedding date sentimentally and subtly sewn into his collar. My dress was a Blush by Hayley Paige ballgown (in the style ‘Scout’), and I loved absolutely everything about it – from its fitted lace bodice to its layered tulle skirt. I was amazed at how well I could move in it on the day of our wedding and I couldn’t wait to show Theoren what it looked like (as I had dropped numerous hints to him leading up to our wedding day)! I will never forget walking down the aisle, with my Dad, towards my future husband. It was a moment that was so surreal – a dream come true. 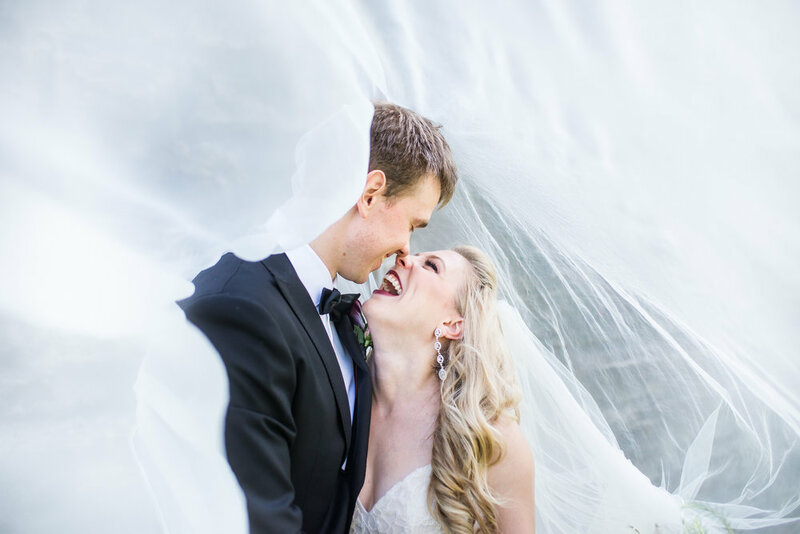 I absolutely loved the blusher style veil that I had ordered from Sara Gabriel, as it made the hand off from my dad to Theoren even more special and traditional. During the ceremony, Michelle Kyle (cellist) and Adam Diderrich (violinist) took care of the instrumentals, which added a classic yet modern vibe to our service. My bridesmaids walked down the aisle in their floor length dresses from Anthropologie’s BHLDN line, with their gorgeous hair and makeup done by the most wonderful ladies from Selah Vie Hair & Makeup Artistry. They all looked so beautiful! The groomsmen also looked pretty handsome, in their rented navy suites from Moores. Actually, the whole wedding party wore their attire like champions, as it was one of the hottest days of the year and felt like 36 degrees celsius! After our outdoor ceremony, guests enjoyed a glass of sparkling wine and delectable passed hors d’oeuvres, while listening to live music by our amazing cellist and violinist. During this time, guests had the chance to sign our guest book, which I ordered custom through Shutterfly. For many of our other wedding services, such as décor and florals, we worked with SMGCC preferred vendors. Kim and her team at Above & Beyond Event Design, and Lanny and Jay of Lyric flowers made my library-themed wedding dreams come to life, and this meant so much to me since the library was where mine and Theoren’s love story began. Kim and Lanny paid attention to every detail, from the exact shades and assortment of flowers in each bouquet, to the greenery woven into the candelabras, to the placement of vintage books for the library-inspired centerpieces, to the organization of the sideboard for the sweets table, to the most gorgeous guest registry table (of which Kim supplied the vintage typewriter, library cards and book stamp), and to our custom mirror signs that were utter perfection! They were my fairy godmother and godfather, as they truly cared about making our wedding day picture perfect and meaningful. Jay of Lyric flowers perfectly paid tribute to my deceased grandfather, by delicately placing a picture of him on the stem of my bridal bouquet. All three of them were so much fun to work with, and they put their heart and soul into every single aspect of the floral and décor. We can’t thank Above & Beyond and Lyric Flowers enough for their efforts and commitment to making our day the most special day of our lives! Nina Polidoro, our amazing photographer, sent us over 800 edited photos of our day and each and every one of them was perfect! Nina is a one-of-a kind photographer, who has contagious energy, the best sense of humour, and is one of the most warm and caring human beings I have ever met. She had a plethora of suggestions for timing and went above and beyond to help us out – for example, she helped to stick my brother’s collar on the day of the wedding when there were suit malfunctions, and she lent us her vintage couch for our photobooth (which she even delivered to the venue without hesitation)! It was an honour to spend our wedding day with her, and she will always hold a special place in our hearts. One of mine and Theoren’s most memorable moments had to do with our first dance. For the first minute or so, we just enjoyed a romantic moment of slow dancing to our favourite song. Then, at a certain point, we broke into a choreographed dance that we had put together only two days before our wedding and didn’t know if we were going to actually pull it off! When we went for the big lift, all of our guests were excitedly clapping and cheering, and it was awesome to know that everyone was having just as much fun as we were! Afterwards, everyone hit the dance floor to music provided by DJ Terry McKone of Partytime Music Services, and live classic rock by Zed Cover Band! Theoren and I could not believe that more than 75% of our guests were on the dance floor for the remainder of the evening! If guests needed to re-fuel, the sweets table from The Cake Box and our late night selection from SMGCC was a good place to go to get some energy! The space for our wedding was absolutely perfect and we couldn’t have picked a better venue for our special day. Wedding specialists, Ashton, Courtney (Special Events Manager) and Taryn (our Maître D’) listened to and were so supportive of every idea, concern and detail, from the moment we stepped through the doors of SMGCC to our wedding day. They were always so fun to talk to and made us feel comfortable and confident. Walking into the wedding planning experience seemed daunting at first, but with wedding planners like Ashton and Courtney to walk me through each step of the way, the experience ended up being so enjoyable. They understand all the subtleties and nuances of a wedding that I couldn't possibly anticipate. They also gave ideas for including certain significant details that turned out better than I could have imagined on my own (like putting together a slideshow of our love story, how to properly word and order our wedding invitations, making our guestbook more unique, sending us the band set list from Ashton’s own wedding, customizing our wine labels in a way that would brand our wedding, and suggesting the proper flow of events for our whole day). It is apparent that Ashton, Courtney and Taryn really care about you, your guests and that your day runs smoothly (Ashton, who was on maternity leave at the time of our wedding, even came out to watch Theoren and I at our ceremony!). The commitment and love shown by the SMGCC staff makes them a memorable and obvious choice when it comes to deciding on where to share the best day of your life as a couple. According to several of our guests, three words to describe our wedding would be: classy, relaxed and warm. We truly feel like we are a part of the SMGCC family, and are so grateful to have come across this amazing place. We look forward to several rounds of golf and après golf activities with SMGCC in the future! Thank you SMGCC for the absolute best day we could've imagined!